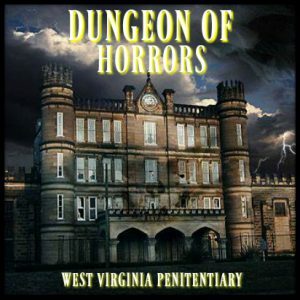 Dungeon of Horrors WV is a Haunted Attraction located in Moundsville, WV. Team Scary Potter and the Hauntwarts Express reviewed this Haunted Attraction on October 6, 2018. Taking a cue from Dante’s Inferno, Moundsville’s Dungeon of Horrors invites you to experience the final moments of an ill-begotten life, the horrors of death, and a journey into the Underworld to meet the Lord of Darkness himself… all in the name of good fun, right? Right? Adding several new, massive (and hungry) residents to the Underworld this season, the Dungeon has further refined the improvements begun by last season’s massive overhaul. The new mega-sized (and mega-hungry) residents are excited to welcome new guests for the 2018 season. With the addition of midway games and the return of The North Walk, TRULY-haunted, nightly tours, the Dungeon now boasts an entire evening’s worth of phantasmagorical entertainment, so come on down to The Dungeon of Horror this Halloween season and experience the thrills and chills for yourself! Interestingly, we noted that the cast of the first, “realistic” portion of the attraction were less intense this season, while the damned representatives of the second half eeked up their ferocity a good bit. It may have been influenced by our particular busload of inmates, but the tone of our incarceration was significantly less tense this season. Though the guards didn’t substantially waver in their characterizations, they were a lot more subdued, even permitting an occasional joke to slip through their stone-faced veneers. The female guard who oversaw us while we were in our cells and the sadistic administrator of our last rites were outliers to this trend. The latter was a much better version of the role than last season. Meanwhile, in the lake of fire (how many times in my life will I get to begin an appraisal with that particular lead-in? ), the malevolent forces definitely found a little something extra to add to their verbal venom this go-round. Performance quality was still varied (a few of the talkers were a little weak, and several of the prisoners were really uninspiring), but there were a lot of intriguing dialogues presented to us. Most of the best interactions that we witnessed were between conflicting cast members. Our favorite exchange, betwixt a pair of mostly-harmless hillbilly gentlemen, put us at the center of a disagreement. Though the discourse was humorous and entertaining in its own right, compared to the (literal) fire and brimstone leading up to that moment, it was an especially welcome moment of breath-catching repose. Additionally, the returning crawling demon girl was even better this year (technically she was interacting with the aggrieved gal in the room with her), as were the occupants of the “execution” and a quarreling couple of characters who were engaged in a philosophical debate as to the culpability of a young man’s soul – normal demon stuff, you know. Keeping most of the interactive actors in groups worked well to establish longer, narrative-rich sequences, but we did notice that there wasn’t a lot of sustained dialogue options available towards the customer in these settings. Actor ad libbing was not overly impressive. The Vilelinist (trademark) was especially convincing, though. We really enjoyed that his initial demeanor was so believable as not just a benign entity, but also as an actor who perhaps was not particularly interested in producing a convincing performance. After the script-flipped, though, he was locked-on and roaring hellfire. That was a fun meta-transition that worked very well. He also tickled the catgut admirably. The Dungeon’s best set returned this year (outlined in Effects below), but we were disappointed to find that it was completely bereft of life. Perhaps the Stygian waters are just not very hospitable to life. Wait… should we be concerned? It made the otherwise-wonderful environment feel under-utilized. The above was ALMOST made up for by the excellent lobby/line entertainer, a mischievous FAWN who teased and taunted any who crossed his path. Remember, he’s a FAWN. Anyone who tells you differently has been misled. Also, the omnipresent voice of an ambivalent-if-cheeky hellion while in the maze was very entertaining. The first act’s population were in, more or less, the same outfits. This is one of the few attractions where such uniformity is appropriate and indispensable. After our descent, however, the variety of devilish costumes on display varied greatly. With most of the Dungeon’s occupants being tormented versions of their former earthly counterparts, there were few, if any, masks and not a great deal of grandiose apparel. This seemed to be adequate though as the Dungeon left most of its visual spectacle to its animatronics. At the same time, every character was still in costume and their make-up affectations were convincing. Considering the disparate vignette character of the scenes we passed through, there were a wide variety of character types present (important to note: Hell still has hillbillies; go figure). The Queen of Hell was definitely our costumed stand-out, though the coin-hungry warden of Styx was well-‘drobed as well. Without the attraction-proper, the friendly FAWN entertaining the crowds in the lobby/yard looked very believable as well. I would love to pass judgment on the specter-like benefactor whose ethereal voice guided us safely through the sheet maze, but, as usual, I was only able to catch a fleeting glimpse. One of these days, enchantress; one of these days. Like a nefarious moth, go toward the lit-up prison. Failing that, GPS works fine, or simply locating the giant mound across the street is a viable option. Though there is a parking lot in front of said mound, when it fills, finding a reasonable spot on the surrounding roads seems to be the local back-up plan. The Dungeon’s former timed-ticketing system has been condensed into a unique take on VIP ticketing. For a price mark-up, customers can purchase time slots during the eight PM hour. At nine, though, general admission begins without specific time slot requirements. Portable toilets were ample as well as a modest concession stand. The prison has its own gift shop, but there is also a merchandise room available at the end of the attraction. In addition to the returning zombie paintball, additional midway games have been added, including a javelin toss, strong-man challenge, and balloon pop. A grumpy, roving performer also entertained the crowd as they waited their turn at the big show. The Prison has a SECOND, auxiliary attraction available, The North Walk. Unlike the Dungeon of Horrors, The Walk is an actor- and prop-less experience, focusing on an exploration of the undecorated portions of the prison. About an hour long, a tour guide took us through a flashlit tour of the Northern wing of the grounds, telling us stories of previous real-life occupants from the prison’s fully-functional past. Oh, and the prison is legitimately haunted. Haunted; not “guy in a suit going boo” haunted, but “poltergeistic apparitions of former inmates” haunted. On our tour, our guide made several attempts to rouse the interests of these spirits. We explored the pitch-black basement in search of the inmate-turned-custodian who has been seen still roaming the floor. Further on, we were shown a specific medical table from the infirmary ward that often causes supernatural sensations to those who lay on it… and then tested it out. We called out to a violent, remorseless inmate to remind him that his back-stabbing former accomplice has been released on bail. He wasn’t very excited about that. The dilapidated halls of the prison were grim… but not nearly as grim as the tales of murder and madness that we heard as we traversed them. No artificially-haunted attraction can unsettle you quite the same as truly macabre history. Throughout our tour, our guide was well-spoken and informative, displaying a deep knowledge of the paranormal events that have happened (and still happen) within the building. The North Walk was an excellent parallel experience to coincide with the Dungeon and put us in a proper mood to experience the man-made version of the supernatural creepiness we had just emerged from. A double-booking of the North Walk and Dungeon is highly recommended to collect the full, haunting experience. Every employee that we interacted with through our evening was friendly and courteous. Thank you to everyone who made our visit so exciting… and chilling! The prison appeared large, dark, and imposing, the perfect environment for an activity meant to cause apprehension and fear. If we had simply shown up, walked to the front door, stood in a roped line, and then gone through the attraction, I still couldn’t have had any serious arguments about the atmosphere. Before the attraction begins, though, patrons wait their turn in one of the prison yards. Turned into a bustling hub of side-entertainments and grubbing, the impressively-stark walls that encircled us made it impossible to forget that this wasn’t simply a thematic facade. We were IN a prison. Eventually our group was hustled into a prison bus by a barking guard, and taken to a much DIFFERENT prison yard. Empty of all merriment, the “vendors” here were offering only life sentences, free of charge. Hands on our hands, we entered the prison complex and the adventure began. Considering the course the next 40 minutes of our lives would take, I can’t think of a better introduction. Last season saw a VERY significant overhaul arrive at the Dungeon. Fortunately, every significant improvement has returned and been positively tweaked. The graveyard still looks wonderful, dank grime and soil underlying its collection of tombstones, wily animatronics, and proppery. The crypt, underground stream, and “clay muck” areas all still look great. There’s a believability to these sets that is very unique to this location. It was not difficult to believe that as we crossed a bridge, astride the remnants of a dripping stream, all of it was natural edifice. Their unlit maze is still the prominent antagonist of the last 20%, and the pair of unique transitional mechanisms have returned as well (to be discussed in Scare Factor). Also : what would the Dungeon be without their spinning metaphor, the Wheel of Torment? One day we will guess the correct direction to spin that thing. One day. Most importantly : last season’s ultimate joy ride has thankfully returned. The Dungeon use a very high percentage of homemade props and ideas, but even when they borrow a widespread effect, they incorporate it in their own, unique manner. Though we were disappointed that our Stygian voyage was absent any external threats this year, we still love this mega-lazer swamp effect, and it’s still the only time that we’ve ever gotten to captain our own vessels at a haunt! Love it. We were excited about several new prominent additions as well. The chained-demon that confronted us at the entrance to the maze looked great, twisting in frustration beside our path. The “Claustrophobia Hallway” or “Birth Canal” effect is no spring chicken at this point. Most people who have been to a haunted attraction in the last decade have experienced some version of this initially-clever design. However, the Dungeon has rebranded this effect as the esophagus of a giant, insectoid behemoth. We felt that the birth canal effect had been granted new creative life as we gleefully fed ourselves to this slavering fiend. For a brief injection of levity, the bathroom scene was appreciated. What exactly does hellspawn read when meditating on the porcelain throne? “Privacy?” This is HELL; there’s no privacy in the underworld! One thing to note, unfortunately, is that there were a few too many close-to-barren areas. With some amazing, creative artistry existing in the bulk of the attraction, the handful of largely empty environments did stand out. A haunt certainly doesn’t need high-intensity along its entire length, but we couldn’t help but feel that a few rooms could have been better utilized. The Dungeon’s narrative element retains its direction from last season – a vision of the arrest, execution, and post-life of a death-sentenced convict… as played out by the haunt go’er. Right; really light-hearted stuff. The first act plays out identically to last season, albeit lacking some of the too-true-to-life intensity it had previously exhibited (see Cast), including the finale which felt a little hurried and, therefore, not quite as profound. A certain deliberate leisure last season allowed all the right dread to filter into the room, but we didn’t even get strapped in this time around so things didn’t feel as uneasy. It was still an effective scene, but just not as fulfilling as it might have been. The back half of the attraction maintained its potent subject matter as well, though it did change out many of its scenes. Thematically, the biggest change probably came from actually being able to hear the cloven-hoofed soul-stealer this time around. “These aren’t dreams; these are nightmares”, he warned us. So were we truly in Hell, or simply a morality-laced fever dream? Who’s to say? Either interpretation works in the grand scheme of things. I want to say that we really appreciate when attractions like the Dungeon of Horrors choose more elaborate and dramatic tones to approach with their haunts, and we felt that they handled the subject matter quite well. A haunt reviewer can only take so many zombie-cannibal-aliens before screaming. Thinking back on it, even though they don’t explicitly bill themselves as such, Dungeon of Horrors is pretty inarguably a claustrophobic’s nightmare. We ended up packed into a bus, locked inside of a tiny cell, placed into an ambulatory coffin, jettisoned down a dark slide, swallowed by a giant insect-monster, and then lost inside of a pitch-black maze. It’s no surprise that a gal from the group behind us descended into a legitimate, “Please call 911!” panic attack by the end. If that outcome doesn’t represent mission accomplished, I don’t know what would. I would generally spend a chunk of this section reflecting on the true-to-life terror of the first act, but as I described in the Cast section, it didn’t have the same unsettling bite this year. Was it still somewhat unnerving and wildly creative? Definitely. It just wasn’t quite as overwhelming as I remembered it being previously. Still, for anyone experiencing the mortal section of the Dungeon for the first time, expect a very chilling evening. Most of the extended-stay actors weren’t directly scary, though they often set up forthcoming startles. The demon-tongued girl was an obvious exception to this. She crawled around our legs, hissing, and bleating. I assume she was simply bidding us a good evening and discussing contemporary international politics. Diabolia is such a beautiful language. The Dungeon’s startle scares were well-positioned. The formula may have not been overly complicated, but it was effective : out of the walls they came, animatronic and human(ish) alike, often from unexpected locations and sliding panels. Additionally, the classic “room goes dark, lights come back on, and boo” aesthetic played out very effectively through multiple scenes, including our introduction to Daddy Death himself, and our Jekyll/Hyde interaction with the Vilelinist (trademark). Environmental scares were in abundance as well. I must necessarily mention the coffin ride again, and add that it ended a bit more satisfyingly jarringly than I had anticipated. “Last Ride” simulators are fine and all, but taking an ACTUAL ride in the Burial ‘Beamer is unmatchable. The earthquake hallway was (literally) unsettling, and the Dungeon’s liberal use of air blasters did a good job of varying the avenues by which the (un)living world could dishevel our composures. We spent about 40 minutes going through the attraction. A general admission ticket is $20, while a timed-ticket for the first hour of operation is $25, so the entertainment per dollar spent ratio for a general admission ticket is 2.0 To experience the North Walk, a ticket will cost $20 additional dollars (but make sure to schedule it at least an hour before you plan to go through the haunt!). Finding the schedule for the Dungeon on the prison’s website does require beginning the booking process of purchasing tickets. We wish that a free-standing calendar image for the Dungeon’s operating schedule was more prominently available. 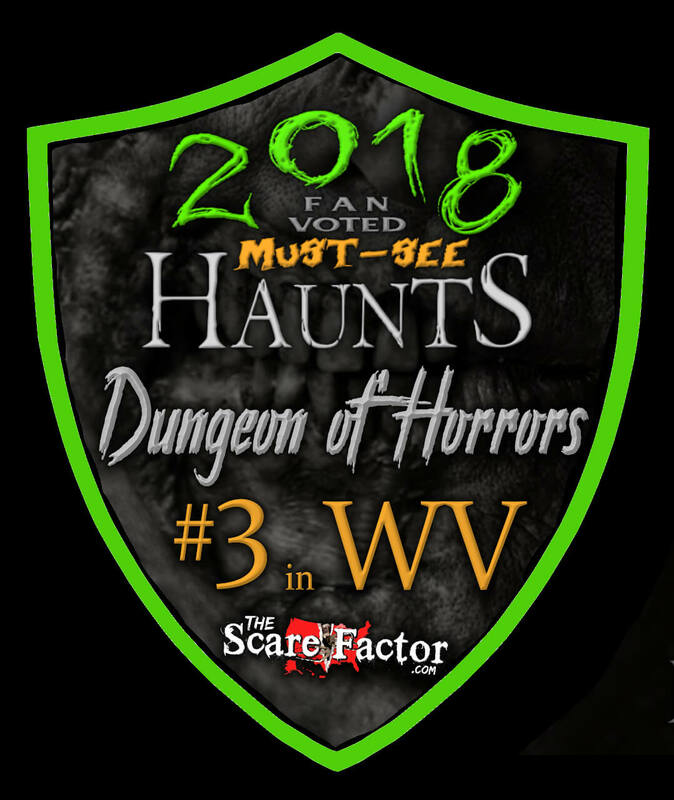 Having kept all of their best effects and scares from last season and added a few more, the Dungeon of Horrors puts forth another great effort this season. Though the first half lacked a bit of last season’s overbearing vigor, the buffed second half made up for any sag. The theme is still refreshingly original and so many of the Dungeon’s unique effects are “can’t misses.” How often does one get to slide directly into the flames of Hades on a potato sack? We recommend a visit to this wonderful attraction this season; just don’t forget to pay the ferryman! Amazing haunt. One of the best we’ve been. Custom sets, and a themed plot that follows you all the …show more way through a real prison. More focus on creepy storytelling than screamy jump scares, but there’s a bit of that too. Totally worth the trip, and the highlight of this year’s Season of the Witch road trip. Also very reasonably priced for such a detailed haunt. 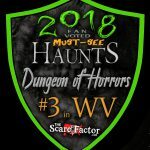 I have been to several Haunted Attractions and this is by far the best in the Ohio Valley. …show more Constantly improving.